Finding your Raspberry Pi isn’t quite reaching its limits? You’re not alone. The Raspberry Pi is more powerful than ever, but it can still be tricky to set up right if you want good performance. It doesn’t matter how you’re using your Raspberry Pi: if it isn’t configured to run at its most optimum, you’re going to have a bad experience. So, take a look at our best tips to find out what you can do to squeeze the most out of your Raspberry Pi. Get ready for some awesome performance! One thing you need to make sure with any Raspberry Pi setup is that you’re using a reliable power supply. The Raspberry Pi 3 (which is the best solution for desktop use) requires a micro-USB power connector. Ideally this should be connected to a power supply adapter with a 2.5A capacity. While it may seem more convenient to connect the Pi directly to a USB port on your power bar, or to use your smartphone charger, these deliver unreliable results. Consider this: You’re using the Pi for desktop work, internet, email, office tasks. Some programming. You don’t want the computer to suddenly freeze or shut down because you’re asking too much of it. Avoid this by ensuring the power supply is up to specification, and reliable. You’ll find a 5V 2.5A power supply is more than powerful enough. Once your power requirements are sorted out, you’ll need to install a distro that uses as few resources as possible. Pushing performance on your Raspberry Pi means keeping things to a minimum, and several Linux operating systems 6 Lightweight Operating Systems for Your Raspberry Pi 6 Lightweight Operating Systems for Your Raspberry Pi Need to squeeze some extra processing power out of your Raspberry Pi? You should try a lightweight operating system. These examples will get you started. Read More (distributions or distros) have been developed with this purpose in mind. Even Raspbian is available in a lightweight “lite” flavor, but you might also consider DietPi or even the non-Linux RISC OS for a truly low-footprint experience. The aim here is simple. With an operating system that takes up less space and demands few resources, you can dedicate what’s left to your current project. It could make the difference between success, and failure. Running out of space on your Raspberry Pi? You can reclaim almost a full gigabyte of storage on your microSD card by removing some of the preinstalled software. You know those tools you never use? For instance, while the Raspberry Pi 3 and later is suitable for use as a desktop, you might not need that functionality. So the presence of LibreOffice may seem utterly pointless. Ready to save 250MB? It isn’t just LibreOffice that takes up space on your Pi. Wolfram takes up around 830MB. You can remove that with the same command, substituting libreoffice* with wolfram-engine. Furthermore, you could ditch minecraft-pi, and even sonic-pi, to make more space on your microSD card. The same is true of any software you don’t need. Of course, if you find yourself mass purging software, it might be a better idea to simply use one of the lightweight distros highlighted above. While a number of websites will not appear as they usually do (or they’ll be less functional), browsing will be far quicker. Overclocking your Raspberry Pi is an obvious solution to poor performance. It comes in particularly useful when using your Pi as a media center with Kodi, or playing retro video games. While older games don’t need accelerated performance, those from consoles from the 1990s and early 2000s do. If you want to overclock your Raspberry Pi, the tools to do so are provided in most distros. For instance, in Raspbian, you can open the Raspberry Pi Configuration on the PIXEL desktop, or use raspi-config in the command line. See our full Raspberry Pi guide Raspberry Pi: The Unofficial Tutorial Raspberry Pi: The Unofficial Tutorial Whether you're a current Pi owner who wants to learn more or a potential owner of this credit-card size device, this isn't a guide you want to miss. Read More to find out more on this. Here, use the arrow keys to select Overclock, then choose the increased setting you wish to use. For the best results, step up to the next level, save, then restart your Pi and the app(s) you’re hoping to gain improved performance from. If you’re overclocking your Raspberry Pi, you should consider some cooling solutions. Everything from heat sinks to liquid cooling 5 Cool Ways to Keep Your Overclocked Raspberry Pi 3 Chilled 5 Cool Ways to Keep Your Overclocked Raspberry Pi 3 Chilled With all the cool stuff you can do with a Raspberry Pi, it's no surprise they can get a bit hot. Here are the best ways to cool them down. Read More is available for this little computer. These can do a remarkable job of keeping the temperature of your Pi’s SoC low, but note that overclocking will reduce the lifespan of the little computer, regardless. All models can be overclocked, but the best boost is likely to be found in a Raspberry Pi 3. Our full guide to overclocking the Raspberry Pi Overclocking Raspberry Pi: How to Do It and What You Need to Know Overclocking Raspberry Pi: How to Do It and What You Need to Know Want squeeze more juice out of your Raspberry Pi? 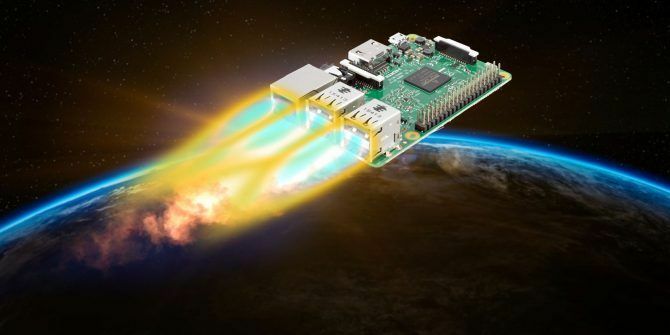 Overclocking your Raspberry Pi can help to maximize performance. Read More will gave you all the steps you need. Be sure to treat overclocking with care, and not expect too much from the Pi. Overheating can be a problem, as can pushing the computer beyond its physical capabilities. Another option is to consider the quality of your microSD card. Whether you’re using a Raspberry Pi Zero or a Raspberry Pi 3B+ The Raspberry Pi Board Guide: Zero vs. Model A and B The Raspberry Pi Board Guide: Zero vs. Model A and B With so many different Raspberry Pi models, how do you know which one to buy? Our ultimate guide tells you everything you need to know! Read More , the speed of the microSD card matters. In short, it can vastly improve the performance of your Raspberry Pi. It’s simply a case of recognizing which microSD cards to steer clear of. To start off, anything from an unrecognized manufacturer should be avoided. These are often relabeled reject cards, or poorly made, and will only bring frustration. Stick to Samsung, SanDisk, and Kingston for good quality cards. Make sure you’re using the right type of card for the Raspberry Pi. Many Pis ship with microSD cards when bought as bundles. These are typically Samsung microSDHC cards with the class 10 rating. This indicates the minimum write speed, guaranteed to be at least 10MB per second or higher. After the power supply, the Raspberry Pi’s SD card is probably the weakest part of the setup. When the original Pi was launched with a standard SD card, it was particularly prone to failure. Later models of the Raspberry Pi rely on microSD cards, but again, there is a problem. First of all, you need to ensure that you’re using good quality cards. $5 cards off eBay are not suitable. You should be using high quality cards for the best results, preferable microSDHC type cards. These have superior error correction, and are much faster than cheaper cards. Looking after your microSD card is vital. One of the ways in which cards are misused is when it comes to switching off the Raspberry Pi. In short: do not unplug the Pi without first shutting down. This will shut your Raspberry Pi down safely at one minute past 12. If you’re concerned about data on your Raspberry Pi, and want to maintain a level of continuity between projects, it’s a good idea to back up. See our guide to cloning your Raspberry Pi’s microSD card Easily Clone Your SD Card For Trouble-free Raspberry Pi Computing Easily Clone Your SD Card For Trouble-free Raspberry Pi Computing Whether you have one SD card or several, one thing that you will need is the ability to back up your cards to avoid the problems that occur when your Raspberry Pi fails to boot. Read More for more information. You probably know that the Raspberry Pi boots from the microSD card. But did you know that it can be reconfigured, and the OS boot from a USB device? If you have a spare USB flash memory stick, or hard disk drive, this may prove useful. It will certainly speed up booting, and make performance more reliable, while expanding the storage capacity of the Pi. This will only work on a Raspberry Pi 3. If you have this version of the board, you should certainly try this out. In short, it means you can change the Raspberry Pi’s boot mode in Raspbian, then format the new storage and copy the key files from the microSD card. The card will still be required for the initial boot sequence, but everything else is then run from the USB device. See our full guide on how to boot your Pi from USB How to Make Raspberry Pi 3 Boot From USB How to Make Raspberry Pi 3 Boot From USB The Raspberry Pi is a versatile piece of kit, capable of a diverse range of tasks. But it has one glaring flaw: the inability to boot from USB. Until now, that is. Read More , and improve your Raspberry Pi’s performance considerably! If you have a suitable external drive, perhaps consider adding it as extra storage for your Raspberry Pi files. USB hard disk drives, solid state drives, and standard USB flash sticks can all be used as additional storage for the Pi. Our guide to increasing the storage space on a Raspberry Pi How to Increase Storage on Your Raspberry Pi How to Increase Storage on Your Raspberry Pi Need more storage on your Raspberry Pi? You have several options available. Here are all the things you can do. Read More expands on this topic in some detail. If you prefer to use a USB flash device for additional Raspberry Pi storage, however, you’ll need to know how to mount the device before using it How to Mount a USB Flash Device in Linux and Your Raspberry Pi How to Mount a USB Flash Device in Linux and Your Raspberry Pi Let's take a look at problems surrounding USB devices and SD cards with popular distros (we're using Ubuntu) and less widely-used distros, such as the Raspberry Pi's Raspbian Jessie operating system. Read More . Finally, there’s a secret in the Raspberry Pi’s hardware that you can use to create some ultra fast storage on your device. While the data stored here won’t be accessible when you reboot, this shouldn’t matter. After all, vital data should always be stored on a removable device, or in the cloud! ZRAM uses the Raspberry Pi’s built in hardware for swap data, rather than relying on the microSD card. While microSD cards can be fast, ZRAM is typically faster. As the entire volume of RAM on your Pi is rarely in use, it makes sense to utilize this resource. If you simply want to get to grips with the code, you can download it from GitHub. Then hit Ctrl + X to save and exit. When you reboot your Pi, you’ll be using efficient ZRAM swapping rather than relying on spare (and slower) microSD card space. Consider what it is you’re using your Raspberry Pi for. Is it really suitable for that little computer? Isn’t it time you stopped using a Raspberry Pi for everything Why You Should Stop Using a Raspberry Pi for Everything Why You Should Stop Using a Raspberry Pi for Everything Many people turn to Raspberry Pi for all of their projects. The problem? They're making the wrong decision. Here's why you should think twice before using a Raspberry Pi. Read More ? After all, it’s just a credit card sized computer. It does a lot for the size, and puts many of the PCs you were using 20 years ago to shame. But that doesn’t mean that you should employ a Raspberry Pi for every single project. Other devices are available. Some projects may work better with a full PC, or laptop. Others might be improved by switching to a smartphone or tablet. Or another single board computer (SBC) entirely. So, even with overclocking, a superior power supply and top-end microSD card, make sure your Raspberry Pi is the right device for the project. That’s arguably the best way to get top performance out of it. With all these changes, your Raspberry Pi will feel like a totally different computer! But still not fast enough? Maybe it’s time to consider one of these Raspberry Pi alternatives or see if Google Coral Dev Board is better than Raspberry Pi Is the Google Coral Dev Board Better Than a Raspberry Pi? Is the Google Coral Dev Board Better Than a Raspberry Pi? Heralding a new era in accessible hobbyist boards, just what is Google's Coral Dev Board? And can it replace your Raspberry Pi? Read More . Explore more about: Raspberry Pi. Christian Cawley is Deputy Editor for Security, Linux, DIY, Programming, and Tech Explained. He also produces The Really Useful Podcast and has extensive experience in desktop and software support. A contributor to Linux Format magazine, Christian is a Raspberry Pi tinkerer, Lego lover and retro gaming fan.